Mount Pearl dentists offer professional take-home whitening kits to brighten Newfoundland and Labrador’s smiles. 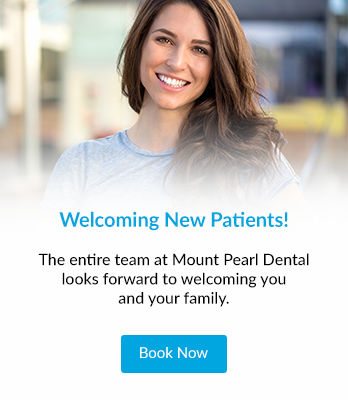 At Mount Pearl Dental we know how important your smile is to your professional success and your social interactions. That’s why we provide the top-performing brands of whitening products for our patients. If you have an event that you are looking forward to such as a wedding, graduation or just want to improve the appearance of your smile, we can help with our in-office and take-home whitening solutions. We offer our patients professional-take home whitening kits to brighten their smiles. These kits contain a high concentration of hydrogen peroxide or carbamide peroxide and provide excellent results in as little as 1 to 2 weeks of use. Before you start whitening, an impression of your teeth will be taken. We will send your impressions to a laboratory to create your custom whitening trays. Custom trays are much more effective that strips or a "one size fits all tray" as they fit into the contours of teeth very nicely. Custom trays also allow for only a small amount of the gel to touch any of your tissue, which helps avoid any sensitivity around your gums. As with all forms of teething whitening, you may experience some tooth sensitivity afterwards. We recommend that you brush with a sensitive tooth paste following your treatment and avoid any foods or drinks that may stain your teeth for at least 1 hour after whitening.